Our first night in the mountains of central Norway, we found ourselves in the absolutely idyllic Budsjord Gard, a small farm converted into a pilgrim and traveler centre. Centre is too grand a word: one of the buildings is a former horse stable where five beds are lined up in the five stalls. The night we stayed there our eldest traveling companion was put up in one of the former granges, where even short people have to stoop to go in the door, there are holes in the walls (a temperature problem on a very cold June night) and there is a nearly-foot wide gap between the entrance and top stone stair, a hole through which it would be a 2 meter fall to the ground below. The common bathroom is a renovated interior in an old building entered through a hobbit-sized door, where a bedrock piece of granite sticks up through part of the floor in front of the wash basin. 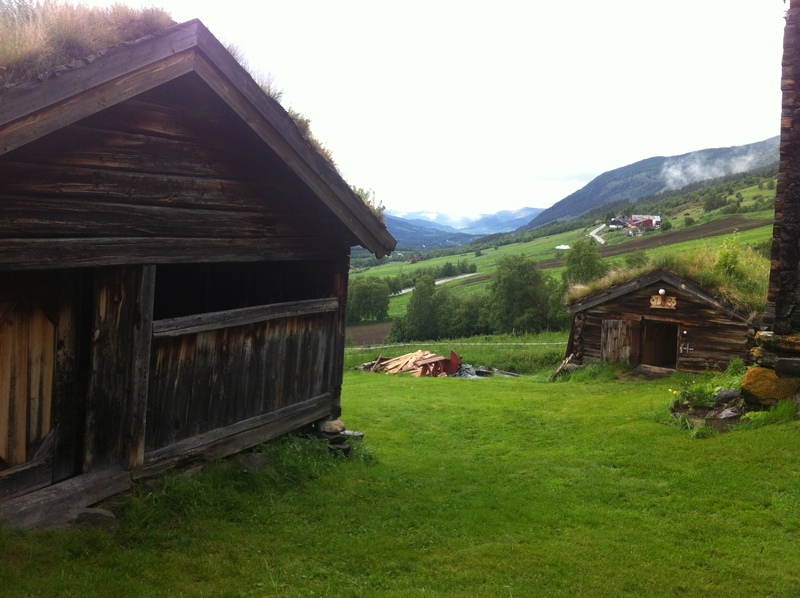 Several of the buildings have the overgrown turf roofs typical of old Norwegian farm out-buildings. I absolutely loved the place. Add to the charm of the scenery a wide-eyed young Norwegian woman who with breathless sweetness told us that it was her first day on the job and we were her first pilgrims, and a one-armed and grizzled German pilgrim who arrived mid-way through out meal, asked for food and lodging and told us, wiping the sweat from his brow with his stump as he ate his supper that he was a former marathon runner and on the St-Olaf way was averaging 25 miles a day through the mountains. Especially impressive given that the range is traversed with swollen spring streams. Between the German’s lively and intelligent face and the almost unbelievable open-eyed innocence of the hostess it was all I could do to wait until the poor man had eaten to pull out my camera and ask them both for interviews. I asked all the usual questions of the German pilgrim. Despite his obvious intensity and the wonderful character evident in his face, I was a bit disappointed with what I got: a listing of distances, mostly. I put away the camera. This entry was posted in Uncategorized and tagged Budsjord, God, miracle, Norway, pilgrim, Pilgrimage, St. Olaf Way, tourism, walking by somethinggrand. Bookmark the permalink. What an encounter, and what an interesting fellow. Thanks for this marvelous post. Lots of food for thought. Thanks for the post. Enjoyed this. I might even agree with the German’s reluctance to tell his story to the camera. In any case, you’ve retold it with all the right emphasis and feeling.